Bladder stones (uroliths) are common problems in both dogs and cats. The most common types of stones are struvite, calcium oxalate, and urate stones. 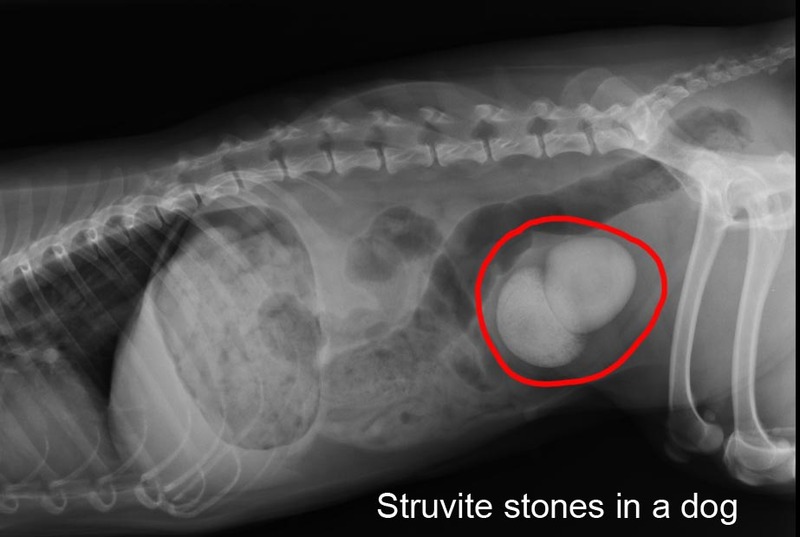 While struvite stones are usually caused by infection in dogs, the rest of the stones are caused by metabolic abnormalities (such as liver disease or high blood calcium), nutrient imbalances from diet or supplements, or genetic conditions that the dog or cat inherited from their parents. Sometimes there are crystals in the urine but no stones. These crystals may or may not be a warning sign of stone risk – this depends on the type of crystals and the pet (dog vs cat, breed, presence of a urinary tract infection). Your veterinarian will need to do tests to figure out what type of stone or crystal is present because that will affect how it is treated (and how you can reduce the risk for having them happen again). In some cases, stones must be surgically removed both to treat them and to determine the exact type of stone. Once the stone is removed and you know exactly what type they are, it’s important to address any underlying health issues that may have contributed to the stone (see below for discussion of specific stone types). 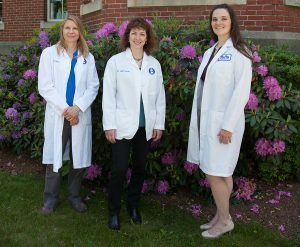 Providing your veterinarian with a complete diet history, which includes the exact diet, treats, table food, supplements, and any other food and treats can help to determine whether there are any dietary factors that could have contributed to the stone/crystal. Based on this information and the stone type, your veterinarian can help you choose an appropriate diet to reduce the risk of future stones. Struvite stones can often be completely dissolved in both dogs and cats using special diets. These diets encourage greater water consumption, contain controlled amounts of protein and certain minerals, and also alter the acidity of the urine. While the protocols for dissolving stones are similar between dogs and cats, prevention of future stones is quite different. Struvite stones in dogs are usually caused by urinary tract infections and a special diet is *not* needed for dogs with struvite stones once the stones are either dissolved or surgically removed. If your dog has recurrent bladder infections that led to struvite stones, aggressive treatment is critical to resolve and prevent further infections to ensure more stones do not form. Struvite crystals can sometimes be seen in the urine of dogs with no urinary tract infection, especially in samples that have been refrigerated or have sat around for a few hours. These crystals are unlikely to suggest any increased risk of stone development and can usually be ignored. In cats, struvite can form without an infection and a special diet is recommended to reduce the risk of future episodes. Most diets designed to dissolve struvite can also be used for stone prevention. Struvite crystals in cat urine, especially in fresh samples, suggests that the cat may be at higher risk for stone development, even if there is no infection present. Calcium oxalate stones frequently occur in certain breeds of dog (e.g. Yorkies, miniature schnauzers, shih tzus) and also in cats. They cannot be dissolved and have to be removed, usually with surgery. Calcium oxalate crystals can suggest an increased risk of stone formation in both dogs and cats. Crystal and stone formation can be caused by other health problems such as high blood calcium, and by diets or supplements that are too high or low in calcium or high in oxalate or in compounds that the body makes into oxalate. When a potential cause, such as high blood calcium, can be found and corrected, the stone risk decreases. 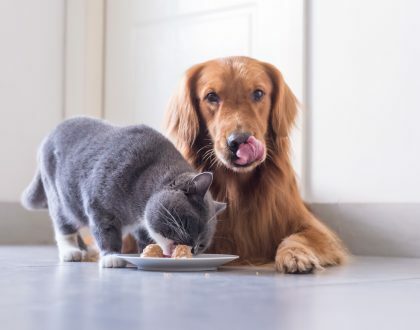 For pets with no obvious cause for stone formation, diet can play an important part in reducing the risk of future stones. Urate stones are caused by a genetic condition in some dog breeds (e.g. Dalmatians, Jack Russel Terriers, Bulldogs) but are also commonly seen with liver disease, especially in dogs or cats with liver shunts. Urate stones are made from compounds called purines which are present in DNA. Purines are high in meat, organs (like liver and heart), fish and seafood. Urate stones can be dissolved in some pets with a combination of a low purine diet and medication. 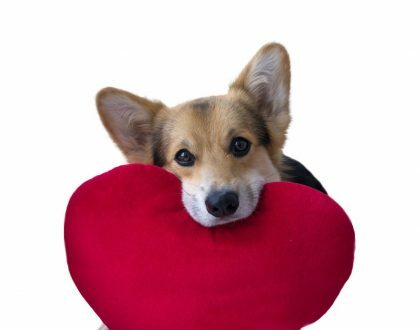 Prevention for dogs with liver disease involves both diet changes and treating the liver disease (such as fixing the shunt) while prevention for dogs with the genetic condition is typically diet change sometimes combined with medication. What goes into a therapeutic “stone diet”? For dogs and cats with bladder stones, we strongly recommend therapeutic diets that you can buy only from your veterinarian that are tested to reduce the risk of stone development. Many diets are designed to reduce the risk of both calcium oxalate and struvite stones while different diets are used for urate stone prevention. These diets are much more effective at preventing future stones than anything at the pet store. If your pet has other medical conditions (for example kidney, liver, or heart disease) it becomes even more important to talk to your veterinarian or a veterinary nutritionist to ensure the diet meets all the nutritional needs of your pet. A lot of research and science goes into therapeutic diets designed to dissolve existing stones or reduce the risk for formation of new stones. High quality ingredients are carefully chosen to reduce the stone building blocks while still providing good nutrition and taste. The diets are then fed to dogs and cats and their urine is tested to ensure that it is low in the compounds that contribute to stone formation and that other properties that help to reduce stone risk are optimized. The measurement of how likely a stone is to form in urine is referred to as the “activity product” or “relative supersaturation (RSS)”. Companies can use these values to make the best diet possible for stone prevention. Diets at grocery or pet stores marketed for urinary tract health in cats focus only on some factors that reduce the risk of struvite stones in cats, but these diets do not undergo testing for activity product or RSS. 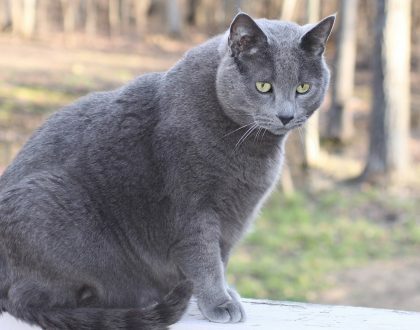 They may be a compromise for cats with a history of struvite crystals or stones that won’t eat a therapeutic diet or if therapeutic diets are too expensive. However, the down side is that they are likely not as effective. These diets will not be helpful for other stone types and may increase the risk of other stone types in predisposed cats. Therapeutic diets designed for stone prevention are tested in pets that ate only the test diet, without added treats, table scraps, rawhides, dental chews, and supplements. Adding in extra foods can decrease the effectiveness of these diets. If going without treats is not an option, ask your veterinarian for treat options that are less likely to interfere with the diet. Many dietary supplements can potentially increase stone risk, especially those that change the urine acidity or include calcium, vitamin D, or vitamin C. Please discuss any supplements you are using or would like to use with your pet’s veterinarian to ensure that they will not interfere with the stone diet. 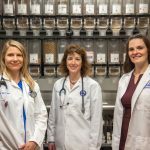 Owners of all pets with a history of stones – even those on stone-prevention diets – should work with their veterinarians to develop a regular monitoring plan for urine testing and either x-rays or ultrasound examination to look for new stones while they are small enough that they may be able to be treated without surgery. Also, while most therapeutic stone diets are safe for long-term feeding, a few are low in certain nutrients and may require more careful monitoring with regular bloodwork.